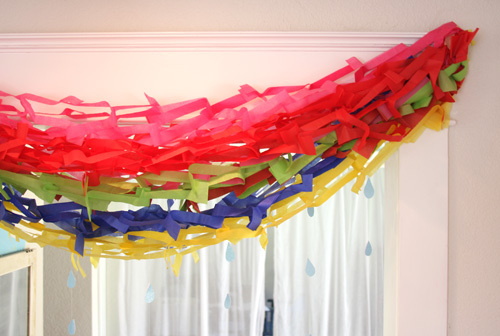 I have seen a lot of fun ideas for a rainbow themed party, but this great rainbow garland that AmberLee made has to be one of the most impressive. The reason I love it is that it cost a whopping $1 and took her 10 minutes to complete. That's it! $1 and 10 minutes. But lets be honest. If I tried to make that it would take a lot more than $1 and I would need about 10 years to finish it. Of course, I can't sew a ruffle. I think I will stick to cutting tissue paper! 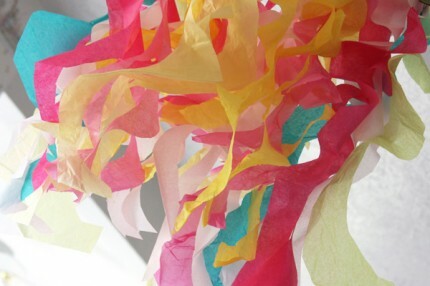 You can see the tutorial for the tissue paper rainbow over at Gives Log. If you don't need a rainbow but still like the neat tissue paper trick, she made some great spiral tissue paper streamers using a similar technique HERE. What a great idea! So bright and fun :) Hope I get to go with you!! Are you familiar with that Mormon song from the 80's..."I'll Build You a Rainbow"? I bet rainbows are gorgeous in Kentucky! 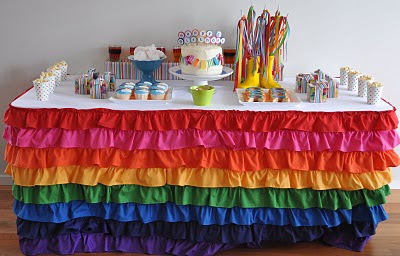 That rainbow ruffled tablecloth is darling. Maybe we could whip one up during our downtime in Kentucky. Um, hello! rainbow party! Ruffled tablecloth! My Katerina went through a HUGE rainbow phase when she was 4ish. This would have been perfect! Oh, now Char has gone and made me cry. I'll be happy as springtime, watching over my boy . . .
Just in case you're not . . .